The following projects have been completed successfully by the NSIIP with the help of its North Shore Partnerships. Click on the drop-down menu to read about our past projects. The City of North Vancouver Library coached almost 20 newcomers to be community storytellers. This project was initiated in order to bring immigrants and refugees together to share their experiences of coming to Canada and to humanize the issues faced by newcomers on the North Shore. Participants received training on communication and presentation skills. Led by the North Vancouver Chamber of Commerce, the forum brought together more than 80 representatives from the business community and 80 internationally trained workers. The event increased awareness about obstacles faced by both employers and immigrants to better integration in the workforce. These events, led by the NSWAC (now the NSIIP) helped enhance service providers’ understanding of integration resources available on the North Shore and provided information to boost collaboration. The North Shore Multicultural Society trained volunteers, who wanted to join the welcome movement, on how to work with newcomers and organizations to help them be more welcoming and inclusive. 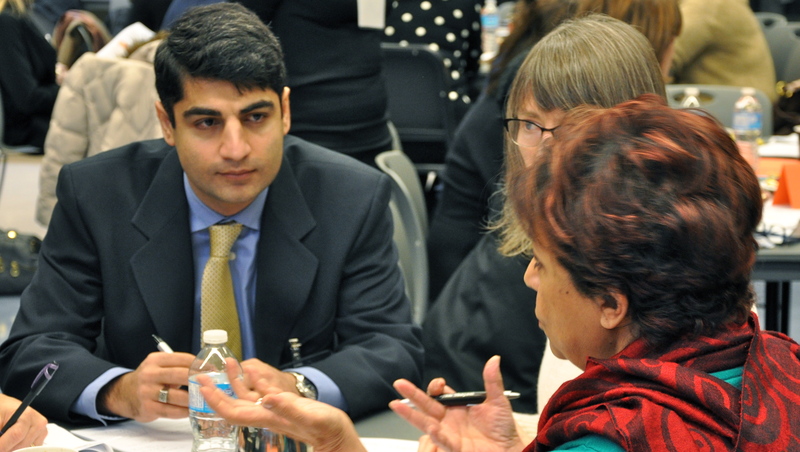 This half-day event, hosted by North Shore Community Resources, focused on the value of representation of new immigrants in community leadership: federal, provincial, municipal, school district, recreation, and private, public and non-profit boards. People who attended the event learned how to recruit and retain culturally diverse leaders. Four informative and inspiring events gave the whole North Shore community the opportunity to learn about newcomer issues and how to develop more welcoming communities. The first NSWAC Community Dialogue was held September 17th, 2013 at the Pinnacle Hotel. The dialogue featured Lionel Laroche, Workplace Diversity Expert. To read the event and key themes shared by Lionel, click here. The program opened with a video – developed during the project and featuring Fred Lee, called “Welcome to West Vancouver”. In this video, Lee dances with four cultural groups: the Gleneagles Scottish Country Dance Club, led by Simon Scott; the Eagle Song Dancers; Teruko Ueda of Tai Chi for Life; and the Vancouver Pars National Ballet, led by Azita Sahebjam. To view the video, click here. Fred Lee MC’d the event. Welcoming remarks were provided by District of West Vancouver Mayor, Michael Smith, and the event was introduced by Sasha Morales – Scotiabank Branch Manager (Marine & Macgowan). The Dialogue included a panel discussion moderated by Mark Forsythe, Host of the CBC’s BC Almanac. CommUNITY hosted a series of dialogues at three local restaurants, where immigrant restaurateurs could share their stories of arriving in Canada and building their businesses on the North Shore. The owners of Cazba, Sushi Nami and Shanghai Village shared the challenges and achievements they’ve experienced in building their businesses. Event organizers hoped the dialogues and food sharing would inspire residents to explore other cultures. Each session targeted between 30 and 40 participants. This youth dialogue focused on building up the strength and consciousness of 100 young people through physical movement. The dialogue was designed to create healthier and more active youth catalysts who feel good about themselves. It involved a fitness class, tie-dye t-shirt making, hip-hop dance, video interviews and a youth dialogue about inclusion and community. The target audience for this event was 100 high school students from across the North Shore. A video of the event captures the energy, enthusiasm and learning of the participants. To view the video, click here. Engaging 15-year-olds is tough in general. And racism, discrimination, power and privilege are difficult topics to discuss at any age. But with funding from the Ministry of Jobs, Tourism and Innovation and with support from our School Districts, we listened, talked to and engaged 3000+ youth with these topics. Everyone learned a lot. This event is part of something called Neonology. Neonology is a movement developed to engage youth in genuine, meaningful conversations about discrimination as a way to stop it from happening. This toolkit is intended to inspire other communities to engage their youth in dialogues about racism and discrimination. This training, led by the North Shore Multicultural Society and its Youth Training Team, targeted immigrant and Canadian-born youth. More than 3000 youth, in classes in both North Shore School Districts, learned about the challenges faced by new immigrants and built on their understanding of how to be welcoming. These videos include interviews with immigrants. They show the challenges of working in a new country and share individual experiences to illustrate what it’s like, as a newcomer, to join the Canadian workforce. The intent of the videos is to engage and inspire community members to play a role in developing welcoming and inclusive communities. In the fall of 2009, the NSWAC applied for and was awarded funding to deliver, Our Welcoming Community, a knowledge development and exchange project, within the BC Welcoming and Inclusive Communities and Workplaces Program (WICWP). Through a series of community engagement activities, including individual consultations with key community stakeholders, focus groups, an immigrant forum, a resident survey and a community stakeholder forum, the project has provided nearly 300 North Shore residents and stakeholders an opportunity to provide input and share knowledge, information and experiences related to the development of more welcoming and inclusive North Shore communities. The input collected was summarized in a report and presented to community stakeholders. It will be distributed throughout the community and used to support the review and development of services, programs and resources. in the District of North Vancouver were between the ages of 15 and 44 years when they arrived in Canada.